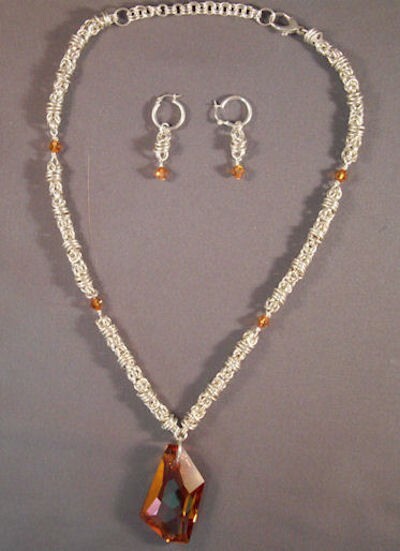 The Ultimate Chainmaille Necklace and Earring set is a spectacular piece of jewelry. It utilizes Swarovski crystals of different shapes. The necklace is adjustable from a 16 inch to a 20 inch length. You will receive numerous compliments when you wear this jewelry. This is a beginner weave. A sterling silver or yellow gold filled balloon clasp is included in the kit. The sterling silver kit includes hoop earring findings and the yellow gold filled kit includes gold plated leverback earring findings. The Swarovsk crystals are included in the Copper Crystal color. Two-tone sterling silver and yellow gold filled is available upon request.